North Atlantic right whales are one of the most endangered whale species in the world. The slow-moving whales that show little response to oncoming vessels are at high risk for ship strike. 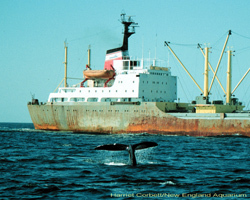 Due to the fact that their migration route and critical habitat overlap major East Coast shipping areas, close encounters with ships (shown here) is a significant threat to their recovery. Image copyright: New England Aquarium. Real-time passive acoustic sensors record and analyze calls in (near) real-time and transmit the data back to shore. 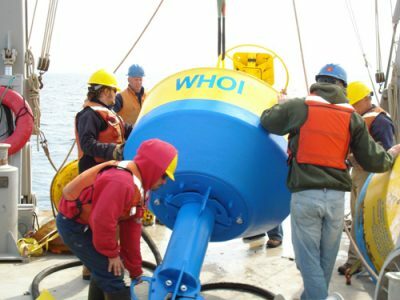 Cornell University and the Woods Hole Oceanographic Institution (WHOI) have developed automatic-detection buoys in association with an environmental compliance mandate for the Northeast Gateway Deepwater Port for liquefied natural gas (LNG) in Massachusetts Bay. The planned route to the LNG terminal would take vessels through habitat for the critically endangered North Atlantic right whale. Vessel collision is considered to be the leading human impact on the species. One measure recommended to avoid collisions between right whales and tankers was that an array of these “smart”, auto-detection buoys be established in the Bay. The 10 buoys create a whale-detection system along the primary shipping lanes for the Port of Boston. Each auto-detection buoy is instrumented with an underwater hydrophone 60-120 ft. beneath the surface. Recorded sounds are carried to the surface via a specially designed cable called the “Gumby hose”, a stretchy, hose-like cable with data-conducting wires woven into it. This hose can stretch to at least twice its normal length, a feature that reduces strain on the anchor line and allows the system to withstand harsh wave action, and keep the buoy above the water. Data from the hydrophones are relayed through the Gumby hose to computers on the surface buoy. These computers continuously analyze underwater sounds to detect possible right whale calls. These acoustic detections are sent by cellular or satellite phone to a server at a command-and-control center, where trained analysts validate the sounds. The analysts determine whether right whales have been detected within the 5-nautical mile range of each buoy, and if so, alert inbound LNG tankers where a right whale has been heard. When LNG ships approach the shipping lane, analysts are on duty until the ships are anchored at port, issuing updates to ships every 20 minutes. Details are also uploaded online to the Right Whale Listening Network, distributed by email, and are incorporated into marine safety bulletins. With advance warning, ships can be slowed or re-routed to reduce the risk for ship strike. At this time, only LNG ships are mandated to reduce their speeds in the areas around buoys that have detected whales, however, all ships are encouraged to check whale-buoy alerts and slow down if necessary. Slowing down increases the chance a ship’s crew can spot a whale while there is a time to avoid it or give the whale a chance to move out of the way. 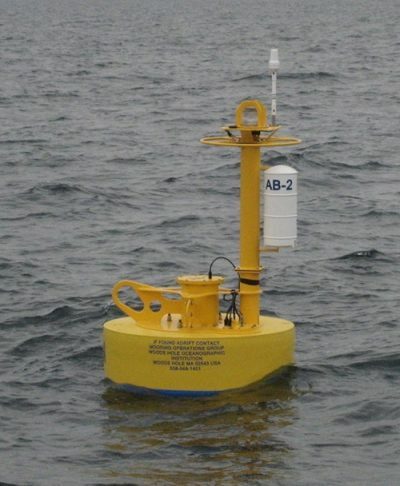 In addition the buoys deployed in the LNG transport lanes, three auto-detection buoys are also deployed in Cape Cod Bay (in coordination with the Massachusetts Division of Marine Fisheries [MADMF]), and two buoys have been deployed off the coasts of Georgia and Florida. For more information, please see How is Sound Used to Study Marine Mammal Distribution and How is Sound Used to Protect Marine Mammals. Researchers deploy a Real-time Automatic-Detection Buoy from the back of a ship. The device being deployed is buoy “AB” for the 10-buoy array currently deployed in Massachusetts Bay to monitor right whales. Image courtesy of Cornell BRP/WHOI. Real-time Auto-detection Buoy AB after deployment, floating on the surface. Image courtesy of Cornell BRP/WHOI. Cabled hydrophone systems also provide continuous, near real-time acoustic data. Here, hydrophones are typically deployed in permanent or semi-permanent installations and are located in pelagic areas where marine animal surveys are otherwise rare. Examples of cabled hydrophone systems include the U.S. Navy’s Sound Surveillance System (SOSUS) and hydrophone arrays on U.S. Navy test ranges in the Bahamas (Atlantic Undersea Test and Evaluation Center (AUTEC)), southern California (Southern California Offshore Range (SCORE)), and Hawaii (Pacific Missile Range Facility (PMRF)). These systems typically have access restrictions due to their military or sensitive nature and their bandwith is often restricted to low frequencies due to the nature of the signals for which they were designed. Nongovernmental, cabled ocean observatories include a vast, integrated network of oceanographic sensors that measure physical, chemical, geological, and biological variables, including underwater acoustics, in the ocean and seafloor. These sophisticated observatories provide fast two-way communications between shore and a variety of oceanographic instruments, allowing scientific research to be conducted continually. These systems will allow for the real time monitoring and localization of marine animals, record continuously over broad frequency bandwiths, and have no restriction on data storage, access, or power supply. The observatories will also be networked, becoming part of the https://ioos.noaa.gov. Cabled ocean observatories include the ALOHA Observatory (ACO) 100 km (60 mi) north of Oahu, and the NEPTUNE/Regional Scale Nodes project along U.S. and Canadian Pacific coast. The ALOHA Observatory provides real-time oceanographic observations from a depth of about 4,800 m. In addition to ocean sounds, continuous observations of temperature, salinity, and ocean currents are obtained and shared in real time with the oceanographic community and the general public. The Regional Scales Nodes project, led by the University of Washington, was the first U.S. regional cabled ocean observatory with nearly 900 km of cable across the Juan de Fuca tectonic plate in the Pacific Ocean. The northern loop of the regional ocean observatory network in the northeast Pacific Ocean, NEPTUNE Canada, led and managed by the University of Victoria, includes nodes, densely populated with oceanographic instruments and moorings, which have been installed at various deep-sea and shallow coastal study sites in the Pacific to investigate phenomena such as ocean acidification, seismic activity, spreading centers, habitat characterization, and coastal upwelling. High bandwidth data and video imagery are transmitted in real-time via the Internet and are accessible to scientists, educators, students, and decision-makers around the world. The PerenniAL Acoustic Observatory in the Antarctic Ocean (PALAOA) is an autonomous listening station maintained by the Alfred Wegener Institute of Germany. The wind and solar powered station is located on the Ekstrom Ice Shelf, in the Eastern Weddell Sea of Antarctica. Hydrophones continuously record sounds from 10 Hz up to 20-70 kHz. Recordings have contained the vocalizations of Antarctic pinniped species (crabeater, Wedell, Ross, and leopard seals), a variety of cetacean species, as well as the sounds of icebergs calving and colliding. All of the recordings are being used to explore the temporal and spatial distribution patterns of vocalizing marine mammals, to gauge the local ocean noise budget, and to monitor the impact of human activities on marine mammal behavior. Individuals can access the real-time data online here. Listen to the Deep Ocean Environment (LIDO) is an international passive acoustic monitoring project maintained by the Laboratory of Applied Bioacoustics (LAB) of the Technical University of Catalonia. The project involves processing real-time data streams from cabled deep-sea platforms and moored stations across the globe to detect, classify, and localize natural, biological, and anthropogenic sounds. This automated system allows for real-time, long-term monitoring of underwater sound sources and supports advances in the knowledge of interactions between marine animals and the environment and the potential impacts of anthropogenic sound on marine animals. Individuals can learn about the various deep sea platforms and moored stations as well as connect and listen to their data streams on the LIDO website. People and Sound > How is sound used to protect marine mammals? People and Sound > How is sound used to study marine mammal distribution? University of Washington, Interactive Oceans.